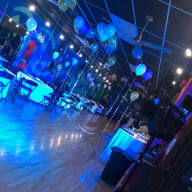 Beautiful, column free 2500sq feet space with brand new wood floors, mirrors, music and lighting system. $100 cleaning fee $100 attendant fee Final rate will be determined based on days of the week, time of day and type of rental. Security maybe required based on the type of the party and amount of people. Renter can cancel up to a week before the event. The deposit will not be refunded but the renter will not be liable for the remainder of the rental fees.